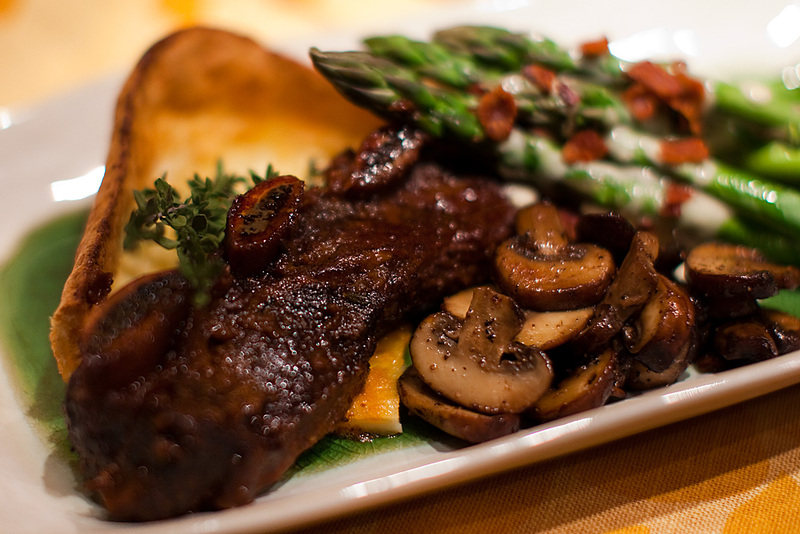 The picture above shows a plating of braised beef short ribs, Yorkshire pudding, sauteed mushrooms and steamed asparagus with stilton sauce. Since this was my first attempt at short ribs, I decided to use a recipe that I had found on the web — and tried not to deviate from it too much (as I have a tendency to do). The ribs turned out well, though I did do a couple few things differently. My first deviation was using a blender to puree the veggies as I don’t own a food processor. The blender was a little more difficult, but produced satisfactory results. I would recommend dicing the veggies more finely than the recipe calls for if you are using a blender. Secondly, I didn’t have a pot that was both big enough to accommodate all the ingredients and was safe for both stovetop and oven use. The easy solution was to use two pots — one for browning the meat and veggies and reducing the wine, then a large roasting pan for the actual braising in the oven. If I were making this recipe again, I would try to find larger, leaner ribs. However, living in a small town, I often have to take what I can get. Now for the side dishes. The Yorkshire pudding is the only one that I give amounts for each ingredient. The mushrooms and the stilton sauce I just made up as I went along and didn’t make note of any exact measurements. Combine flour and salt in a bowl, add the milk and water and beat with a whisk until fluffy (the recipe I have written down uses the word “fluffy” but the result will be more like pancake batter than what I would call “fluffy”). Add the eggs and beat until large bubbles rise to the surface. Then put the batter in the fridge. Put the butter in a 9×13 oven-safe baking dish. Place the dish in a cool oven and preheat the oven to 400° to heat the dish and melt the butter. Note: Keep an eye on the melting butter. If you think it has melted and is browning too much, remove it from the oven early. When the oven reaches 400°, take the baking dish out, remove the batter from the fridge, whisk it briefly to create some bubbles, then pour it on top of the melted butter and put it back in the oven. Bake at 400° for 20 minutes, then reduce the heat to 350° and bake for an additional 10-15 minutes until golden brown. Heat a pan over medium heat. Add 1-2 tbsp butter. When the butter has melted, add sliced crimini (or other type) mushrooms to the pan and stir. Add a pinch of salt and some black pepper. I used McCormick’s Smokehouse Pepper to add a smokey taste, but regular pepper will do. Continue stirring over medium heat until mushrooms are done. Start the stilton sauce by melting a tablespoon of butter in a small sauce pan. Then add a tablespoon of flour and whisk the mixture until it starts to brown. Continue whisking and add 3/4 – 1 cup of milk. When the milk has warmed, add crumbled stilton cheese and continue to stir. Gradually add stilton until the desired thickness is achieved. If you make it too thick by mistake, whisk in a little more milk to thin it out. Steam the asparagus and drizzle the stilton sauce over it after it’s plated. Garnish with crumbled bacon. ~ by peeancefreeance on October 31, 2010.